Buying your first Knoxville home comes with many expenses. Inspections, earnest money, closing costs, and the down payment all add up quickly. You often feel like you’re cutting a new check every time you turn around. 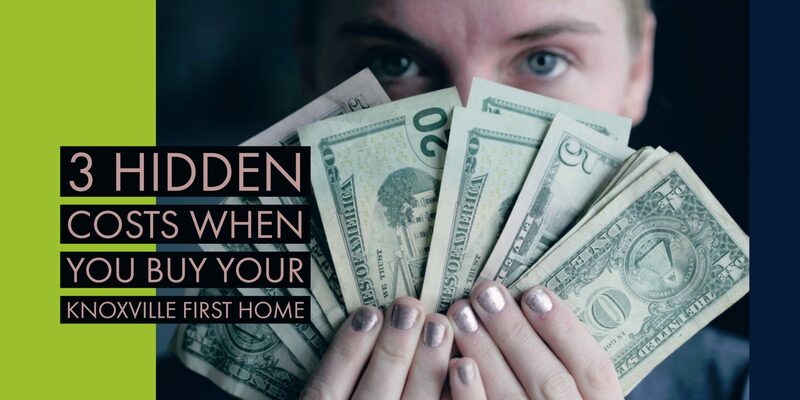 Even when you’re prepared for the obvious expenses of buying a home, first-time buyers are often caught off guard with some of the hidden expenses of buying a home. In this post, we’ll cover the 3 hidden costs when you buy your first Knoxville home. Appliance break? AC stops working during the dead of summer? Or, your hot water heater suddenly goes on the fritz? Welcome to owning your first Knoxville home. One thing that buyers often forget to budget for is routine maintenance costs. As a homeowner, you never quite know when something is going to break. It’s important that you have an emergency fund in case of those accidents. It can happen your first day of owning your home or 5 years into owning a home, at some point something will break and you’ll need funds to cover the cost. If you’re afraid about the upfront cost, you can always consider getting a home warranty. Home warranties cover a whole slew of things in a home and they come with a low cost. Outdoor maintenance is often an underestimated cost when you buy your first home. Your yard may take more to maintain than you expect. Mowing the lawn can be an expense if you don’t have a lawnmower. You’ll also need gas for the mower. In addition, mulching and maintain your flower beds can be an expense as well. Oftentimes, buyers don’t even think about what it will cost to maintain a yard. When you move into your first home, there will inevitably be things that you need. And, there will be even more things that you want. Buyers often underestimate the cost of the expenses. When you move into your first home, you may need to buy a washer and a dryer or a lawn mower. There will be other items that you will also need to buy out of necessity. Then, there will be the items that you want for you home. Your old furniture may not quite not fit, so you may want to replace some items. Be sure that you properly budget for these expenses. You don’t want to go crazy your first few months of homeownership and get a mountain of debt. Buying your first Knoxville home is an exciting and overwhelming experience. If you’re like most first time buyers, you may not be sure where to start. If there is anything we can do to help you in your home search, please do not hesitate to contact us. Are you ready to start your home search? Visit our home search page to get started today.